Three weeks before the start of the current Israel–Gaza conflict, the Palestinian Ministry of Health in Gaza declared an emergency, saying that they were unable to maintain health services owing to a lack of sufficient electricity and necessary supplies. Elective operations had to be cancelled. Thirty per cent of essential medications were out of stock. Healthcare in Gaza has been under extreme pressure since 2007 because of the ongoing blockade imposed by Israel. This has resulted in significant difficulties in the sourcing of medical supplies, and in providing citizens with access to specialist care. Three previous Israeli military operations in Gaza (2006, 2008-9, and 2012) had already caused considerable damage to the healthcare infrastructure. The report also revealed that children were suffering immensely, and that a large proportion were affected by malnourishment caused by the blockade. The prevalence of anaemia in children under 2 years stood at 72.8%; while the prevalence of wasting, stunting, and being underweight was documented as 34.3%, 31.4%, and 31.5%, respectively. The current Israeli operation in Gaza began on 8 July 2014. After a month of intense bombardment, the Palestinian death toll at the time of writing is 1948 (of which close to 25% are children) and 9875 wounded, according to UN figures. The UN has declared the situation “a humanitarian and health disaster of widespread proportions,” and medical services and facilities are on the verge of collapse. Any hope of stabilisation or improvement of the pre-existing healthcare crisis in Gaza has been set back years. The UN humanitarian coordinator in the occupied Palestinian territory, in a joint statement with UNRWA and the World Health Organization, expressed “grave concerns” for the lack of protection for medical staff and facilities, as well as for the people of Gaza’s deteriorating access to emergency health services. They stated that a third of hospitals have been destroyed or damaged due to shelling, and several clinics, ambulances, and healthcare facilities have been directly targeted (see table, click to maximise image). The Ministry of Health estimates that Gaza’s ambulance service is running at only 50% capacity owing to a lack of fuel. A nurse and an administration manager were killed after Israeli airstrikes in their immediate vicinity, and at least 38 healthcare staff have been injured. The UN humanitarian coordinator maintained that “international law sets out clear obligations on the parties to the conflict to respect the status of hospitals and medical facilities as protected objects, to respect the status of and ensure the protection of medical personnel, to ensure the protection of civilians, and to respect the fundamental human right to health.” On 28 July, WHO issued a statement deploring what it described as “the continuing trend for healthcare facilities, staff, and vehicles to come under direct fire in Gaza.”  The British Medical Association expressed deep concern at the shelling of medical facilities in Gaza, and demanded that the principle of medical neutrality be respected. 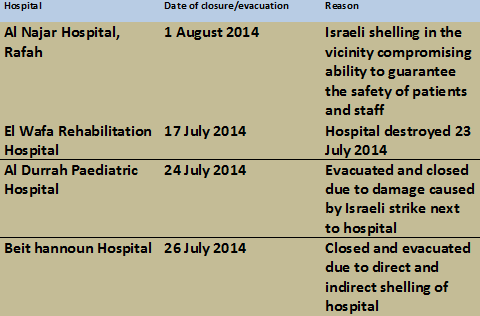 Despite this, the shelling of hospitals by Israeli forces continued during the conflict. The acting head of the office of WHO operations in the West Bank and Gaza Strip declared: “the ability to provide necessary healthcare is being severely compromised. This puts the lives of thousands of Palestinians in needless danger.” Critical supplies of medicines are almost depleted and, after Israeli bombardment destroyed the only power station in Gaza, hospitals are dependent on unreliable backup generators. The current situation is an acute and extreme exacerbation of the pre-existing pressure put on Gaza’s healthcare system owing to the blockade over the last seven years. A healthcare system needs not only medical supplies, but fuel, electricity, personnel, and adequate referral facilities, as well as adequate provision for chronic conditions, in order to function. Health is fundamentally more than just the right to medical care in an emergency. The Universal Declaration of Human Rights recognises that the right to health can only be upheld in an environment in which there is safety from mortal danger, freedom of movement and employment, adequate food, shelter, and sanitation. These fundamental human rights are violated by the ongoing policy of blockade and military operations in Gaza. We call on the Israeli government and the international community to ensure that these basic rights are respected immediately. We ask our medical colleagues to join us in the demand for international standards to be upheld for the people of Gaza. Jamila Sherif is a GP and clinical teaching fellow at the department of primary care and public health, Faculty of Medicine, Imperial College London. Perviz Asaria is a registrar in cardiology and general internal medicine, and a Wellcome Trust clinical PhD fellow at the department of epidemiology and biostatistics, Imperial College School of Public Health. Nadya Rahman is a GP in Greater London. Competing interests: We have read and understood BMJ policy on declaration of interests and declare the following interests: None. 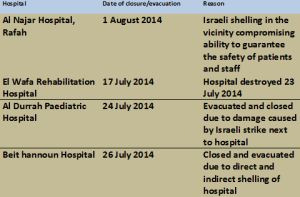 Gilbert, M. Brief report to the UNRWA: The Gaza Health Sector as of June 2014. Office for the Coordination of Humanitarian Affairs. Press Release: United Nations warns of “rapidly unfolding” health disaster in Gaza. Medical Aid for Palestinians. Health disaster in Gaza. BMA. Shelling of Medical Facilities in Gaza. Nott, D. The Daily Mail. “It’s like the Apocalypse” says British doctor in Gaza: In a harrowing dispatch, heroic NHS surgeon describes horror of treating child bomb victims…during a ceasefire. 3 August 2014.